"Nothing in life is as exhilarating as being shot at and missed." Whether you feel exhilarated, relieved or merely grateful for having survived the past two brutal years in the pork business, the time has come to begin healing and formulating strategies for rebuilding equity. The 18th Annual PORK$HOP seminar, sponsored by CPA firm Latta, Harris, Hanon & Penningroth, LLP and FBS Systems, Inc., will assist you in this daunting task by assembling experts in accounting, taxes, law, finance, and information management to provide a concise, coordinated overview of the costs, risks and opportunities facing pork producers who strive to thrive in the next decade. Please join us and other pork industry leaders for this unique, timely, event on June 8th, one day prior to and just 90 miles east of the site of the World Pork Expo at the Clarion Inn, Amana Colonies. Speaking of seminars, the biggest training/networking event of the year (and maybe history of our company) is coming up this summer--the 2010 FBS User Conference and 30th year celebration. We'd appreciate your input in helping us select topics that have the most value to you. Just click on this link to complete a survey that will take less than five minutes. We'll announce the User Conference schedule and agenda soon so make your vote count! Q. I would really like to use the User Defined Report by Group in Smart Feeder, but how do I get started? 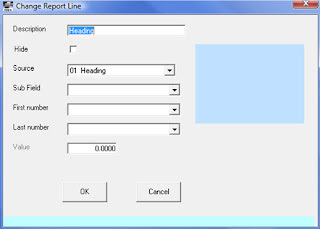 In the middle of the screen is a line that says, “Report to Print.” If starting from scratch select either “First Report” or “**Add New Report”. Next, click on “Define Report” in the bottom left hand corner. Give the report a meaningful name by clicking on the “Report Name” button. Then start adding lines by pressing the “Add” button. Hide. 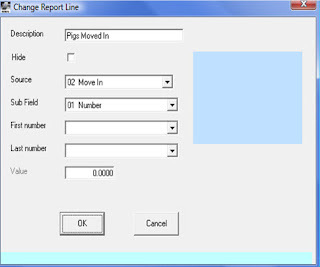 Check this box if this line will be used for a calculation you don’t need displayed on the final report. Source. There currently are 34 sources of information for User Defined Reports. You’ll find them listed in the FBS Help file. 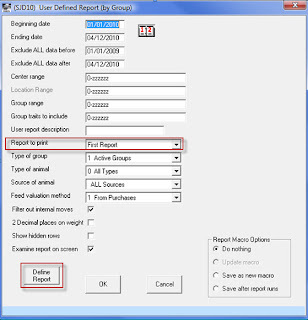 The help file can easily be accessed by pressing F1 on your keyboard while in the report definition screen. Sub Fields. These are based on the source and determine what divisors or calculation (i.e. “Per CWT” or “Total Dollars”) will be displayed on this line. Combined with the sources they provide 568 possible calculations. To see a list and description of sub fields see the FBS Help file. First Number, Last Number. These fields allow even more reporting possibilities by predetermining the range of items—such as ledger accounts, feed ingredients or death loss causes—to be included on each line. Value. If you are using a Calculate line source this field can be used for a “plugged” value such as “.74” to convert live pounds to carcass pounds. Let’s do a quick example to add a line for "Pigs Moved In." 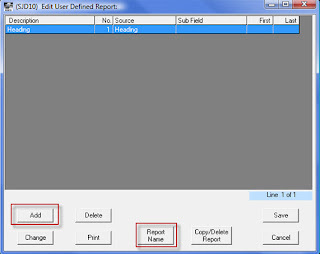 As you can see, the Smart Feeder User Defined Report has unlimited capacity and flexibility. In addition to the on-line Help file, FBS schedules webinars, classes and on-site training to help you “mine” more valuable knowledge from your data. Thanks again, FBS Technical Services Manager, Sarah Dixon, for submitting this question and solution. Way too often I hear a new computer "tale of woe." Generally the cause is a hard drive crash or a virus, and the victim is a novice computer user. This time the call came from a colleague who runs a large production record service bureau. He asked me about my experience with "Version 6" of a popular production record package from which a prospective client wanted to move his data. It's a common practice with ag software publishers to import data files from their competition. In the olden days this required a great deal of "reverse engineering" because software was often written in a proprietary/undocumented data format. Most modern software now run in an "open" database such as Access or SQL or even have "import/export" functions that convert or read Excel, CSV or text files. While prior versions of the program in question likely had these capabilities, "Version 6" poses three aggravating and costly obstacles. 1. It's written in a proprietary format. 2. It's owned, controlled and supported "offshore." 3. The new owners are not particularly interested in "playing ball" (at least the American style). As a result, the "V6" user is forever locked out of his own data and will "beholden" to the software company for as long as it's in business. The larger message isn't' so much to stay away from a specific program as it is to ask yourself (and the software vendor), "Do I have access to my data outside of your program? (In case I want to move on or you go belly-up.)" With more and more applications moving to the "web" this concern will become more and more relevant. Your accounting and production data are the modern equivalent of your "family jewels," representing years of work, irreplaceable information and proprietary knowledge. Please don't stash these priceless jewels in a "black box" without a key.